Between June 2013 and March 2014, I was honored to serve as part of the Chair Committee for the Information Architecture Summit. It happened to be the event’s fifteenth anniversary. This being the third time I worked on the event, I wanted to give it a little 15th birthday present. What would a fifteen year old IA conference want more than some documentation of all this grassroots glory!?!? I set out to find out what had happened the past 14 years. Then throughout the planning process, I created diagrams and information graphics that helped the team and our community understand the interior workings of the beloved community event. I have collected them all below along with some photos of them in action at Poster night. Yes, this graph is real. And yes, it was worth it. Note: this represents my time as well as an agreed to average from my co chairs. 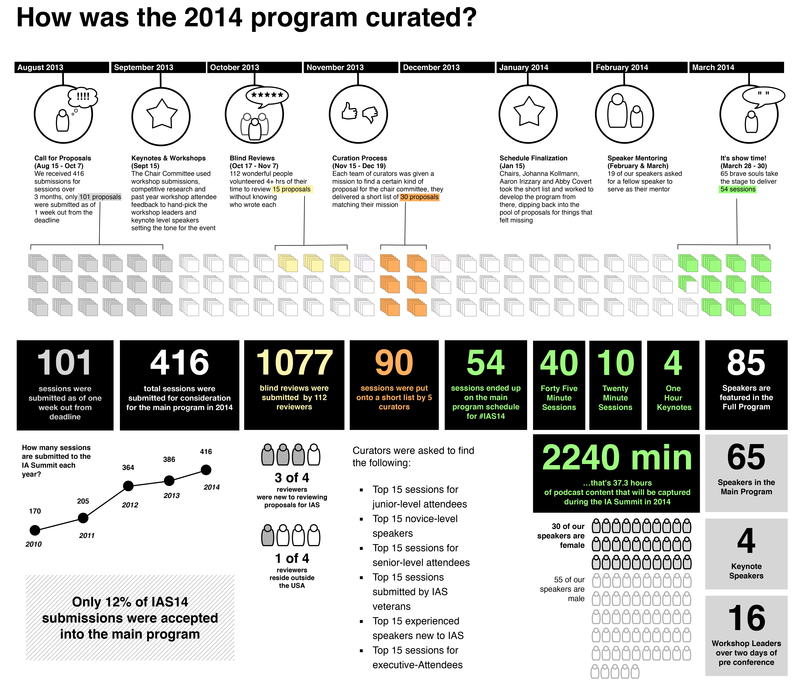 I am quite proud of the process we used to cast the program. I still don’t know if our low acceptance rate is a help or a hinderance to our community, but it was fun to document and improve incrementally. 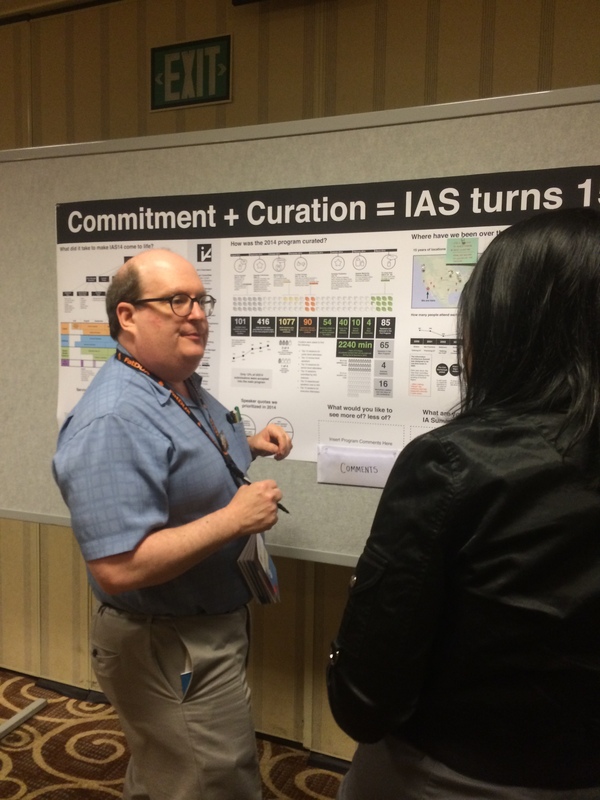 Researching the history of the IA Summit proved to me that the task was worthy of accomplishing. There is so much love. So much tender care… and yes so much human drama wrapped up in this beautiful special event. A good ol hierarchy diagram of all the tasks and roles we need to make this event happen each year. Who doesn’t love that?! 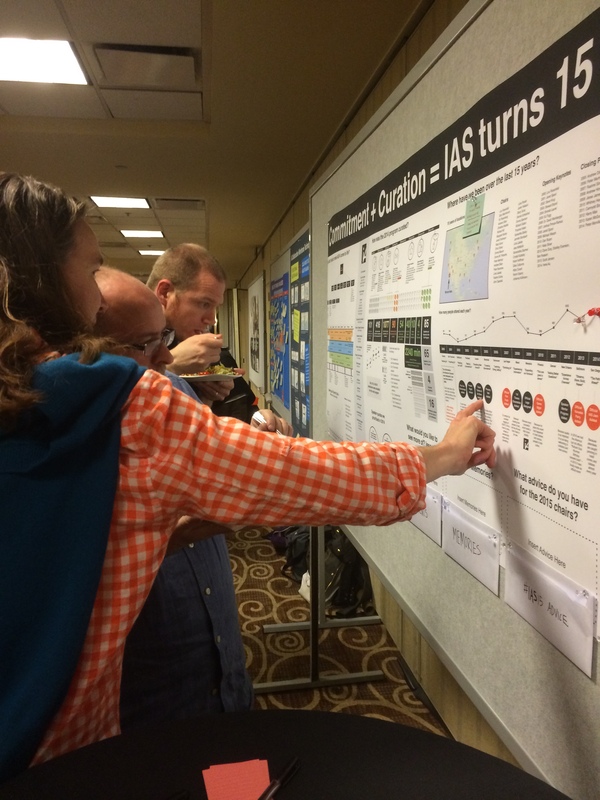 Once I had all the pieces, I thought what better place to insight conversations than at poster night at the IA Summit. Lovely! Wasn’t it the making of the IA Summit 2014 though? Thanks for posting this! My group (mkeux.com) is starting to plan to host a regional conference and this is a great breakdown of the effort needed. I’ll definitely be sharing widely with our committees!